If you are looking for a fascinating lake fun in Branson, the Tri-lakes area is the place to go. In this area, you can find dozens of unique attractions along the banks of Table Rock Lake. It’s in this place also where you can enjoy many different kinds of water activities. Some of 5 favorite water activities that you can enjoy in Branson lakes include swimming, fishing, boating, kayaking, and sailing with the catamaran. If you want to experience a unique lake fun in Branson so you can enjoy an exciting water activity by swimming on a cool water of the lake, don’t miss to visit Moonshine Beach in Branson. The beach is a perfect place for the whole family who wants to enjoy swimming, picnic or camping. Beautifully located on the north end of Table Rock Lake, this sandy beach is a great place to enjoy spectacular views of the beautiful lakeside scenery. The beach is five minutes drive away from Shepherd of the Hills and Dewey Short Visitors Center and less than ten minutes from the famed Branson Strip. This peaceful sandy beach in Branson features great amenities that include kids play ground, pavilion, food vendors, restrooms, and showers. For adventurous water enthusiasts, the beach also features a boat launching ramp which is perfect for those who want to enjoy great water sports activities such as fishing, boating, parasailing, jet skiing, waverunners, and more. If you want to have a break from your busy work, have some lake fun in Branson and spend a relaxing escapade at Moonshine Beach. Moonshine Beach in Branson is nestled in a long gentle cove area of Table Rock Lake and very accessible to the Chateau on the Lake Resort. 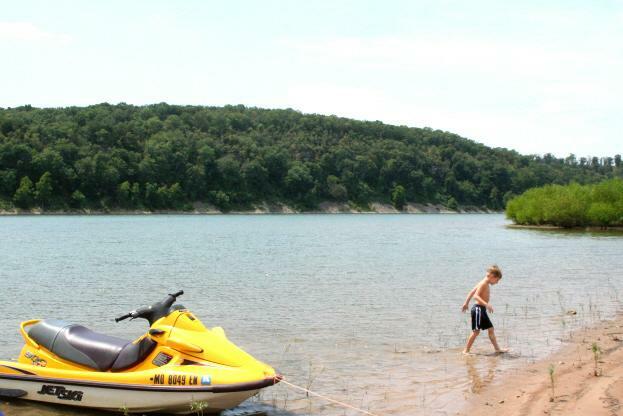 As the largest sand beach in southwest Missouri, Moonshine Beach has a myriad of water activities on the 43,000 surface acres on the pristine lake. Whether you come to the beach to play beach volleyball, sunbathing or swimming, Moonshine has everything to give you fun and excitement. Fishing is another favorite water activity in Branson that is enjoyed by local residents and visitors alike. If you want to experience a great day of fishing in Branson, spend it with Stone’s Guide Service. Your fishing adventure with Phillip Stone will guide you to Table Rock Lake, Bull Shoals Lake or Lake Taneycomo. With over 20 years’ experience on the Tri-lakes area, Phillip assures every fishing enthusiast a successful fishing trip. Stone’s Guide Service offers 8-hour trip, 6-hour trip, and 4-hour trip all in a day to individuals, families, groups, and professional anglers. Whether you’re a neophyte or a pro angler, your trip will be tailored to the type of fish you want to catch. If you want to spend a fishing adventure with another fishing guide service, try the Branson Guided Fishing Trips that operates in Lake Taneycomo and Table Rock Lake. This USCG licensed fishing operator, assures you to enjoy a beautiful day on the pristine waters on the two lakes. Branson Guided Fishing Trips is the only fishing guide in Branson with multiple large boats to give each angler a comfortable and safe ride. Boating is another great water activity to enjoy in the Tri-lakes area. As one of the premier water sports adventures in Branson, boating can still be enjoyed by those who don’t own a boat as they can avail boat rentals at State Park Marina, Lake Taneycomo Boat Rentals, or at Indian Point Marina. State Park Marina has got everything for every water adventurer, including boating, parasailing, and daily cruises on The Spirit of America, a 48-foot sailing catamaran. For your ultimate boating experience on the lake, you can rent different kinds of boats such as wave runners, ski boat, pontoon boat, bass boat, and much more. Lake Taneycomo Boat Rentals is another boat rental operator in Branson that offers a safe, clean, easy and reliable boat rental service. Here you can rent different kinds of boats such as Jon boat, bass boat, and pontoon boat. Indian Point Marina is another full service marina in Branson that offers numerous amenities on the water. As a vacationer, you will be pleased with their wide selection of rental craft which includes tri-toons, pontoons, deck boats, skiboats and waverunners. This marina also has a gas and pump station, a tackle store complete with live bait, fishing licenses, groceries and camping supplies. Taking a water adventure with a kayak or canoe at Table Rock Lake is another great water recreational activity that you can enjoy in the Tri-lakes area. These canoes and kayaks are lightweight and easy to lift and can be powered by humans using paddles. These boats can be used for various water sports activities, such as fishing, paddling for fun on the calm waters of Table Rock Lake or drifting through the river’s current. Kayak or canoe has a couple of differences with regards to its features, look and advantages. Kayak has less surface area above the waterline than a canoe or row boat, so it is easier to manage especially if there’s wind. Majority of people also use kayak because they tend to be quieter through the water than a canoe or row boat. Kayaks are narrower than canoes. When the kayak capsizes, the paddler is not thrown from the craft, allowing him to right the craft and continue paddling. Canoes and kayaks usually have different kinds of paddles. Paddler in a canoe uses single-bladed and double-bladed in kayak. Canoes usually have an open deck which means that the inside of the boat is open and uncovered. On the other hand, kayaks are usually closed-decked which means that the inside of the boat is enclosed and surrounds the paddler. These two boats also have different purposes. Canoes are like sport-utility vehicles of the recreational boating world. They can carry more people, making them ideal for families to enjoy paddling leisurely around the lakes. Sailing with the catamaran, The Spirit of America is another great water activity to enjoy on the lake. This 48-foot sailing catamaran, is a great way to feel the gentle breeze and see the clean and crystal clear waters of Table Rock Lake. The 49-passenger catamaran sets sail every day at noon and 2:00 pm right from the State Park Marina. This catamaran operates a sailing cruise, a Water World Adventure Cruise, and a Sunset Celebration Cruise. Whatever lake cruise you choose, the catamaran drops anchor after it reaches the destination, and so the passengers can get in the water. Then the water adventure begins. You can choose to play, get a nice tan or simply relax. 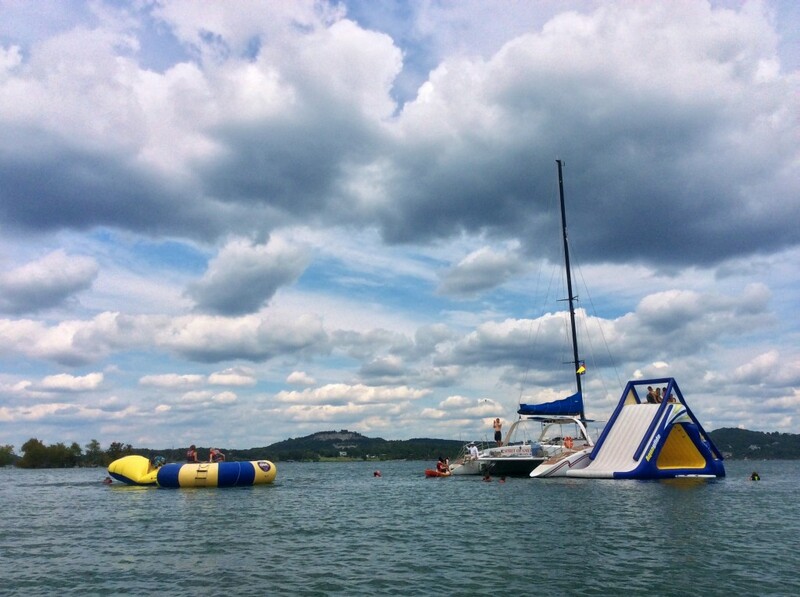 The catamaran brings many different kinds of water toys/activities such as kayaks, a water trampoline, a blob, and a 20+ ft. inflatable water slide. You have many options to experience a thrilling water adventure. If you chose a sailing cruise, it can be fun and exciting as you set sail with the Spirit of America. Here you will get the chance to see crewmates and passengers lift the prop and hoists the sails, then kick back and relax for a 90-minute excursion on the pristine Table Rock Lake. If you are looking for the best thing to do to enjoy a wonderful vacation in Branson, these five favorite water activities will give you ultimate lake fun in Branson.